This thought has come on and off in my head through the year. And I am trying to reinforce it in my life especially when I am at the end of the year, when I am having to go through difficult situations in life. 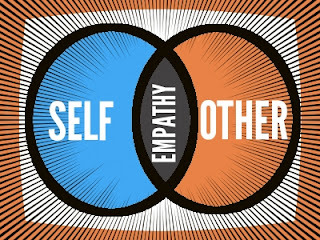 That exactly is what the word empathy means, you put yourself in others’ shoes and try to feel the pain. Well, I am neither trying to become Mother Teresa nor advising you to become one. But just think through it, you could avoid so many tiffs with may be a friend of yours or your partner, your mother in law or your colleague; maybe anyone only if you could realise that more than half of the problems in life exists only in our minds. The words that you speak in anger can cause irreversible change of the perception of you in the other person’s mind. So always apply this thumb rule before you could react in adverse situations; why is the other person doing what they have done? how would you have reacted if you were to go through the same? A little Empathy can beat the Ego in you to save most relationships.